Life has been difficult for Palestinians under Israeli Occupation in the Gaza Strip since the Six Day War in 1967. Since the January 2006 electoral victory of Hamas and the blockade of Gaza's border by Israel, with unemployment soaring to 60% and food, water and medicine in short supply, the psychological needs of its traumatized population have never been greater. Professional psychologists, however, are in desperately short supply. YOUNG FREUD IN GAZA profiles Ayed, a young psychotherapist for the Palestinian Authority's Clinic for Mental Health, and shows his consultations with a variety of patients, both male and female, adults and children, in his office and during house calls, providing therapy or prescribing medication for depression, stress, anxiety attacks and suicidal tendencies. Filmed during 2006-2008, against the violent backdrop of armed clashes between Hamas and Fatah factions, Israeli missile attacks and the constant overhead presence of a surveillance dirigible, the film shows Ayed training young wives and mothers in deep-breathing exercises to calm anxiety, counseling maimed Hamas and Fatah militants in meditation techniques, and leading children in group therapy sessions in which they discuss their reaction to the death of siblings and draw pictures to cope with their emotions. 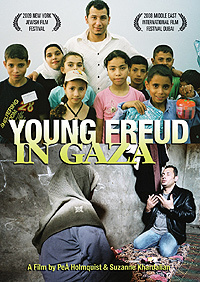 YOUNG FREUD IN GAZA also shows Ayed at home, relating to his parents and other family members and friends, in the process revealing that this young mental-health doctor is struggling with some personal issues of his own, including serious doubts that he is able to help his patients. As he acknowledges, "Gaza needs a million psychologists." Near Jerusalem, the construction of the separation wall continues, a few feet from a senior citizens' home. Through a series of remarkable personal accounts, fifteen women reveal their roles in the patriarchal Islamic society of the Gaza Strip where men dictate most aspects of life.